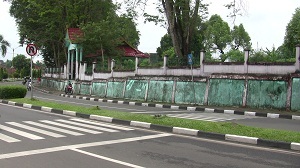 On the west side of the City of Jambi there is a cemetery known as “Pekuburan Sengkawang” (Sengkawang Cemetery), or “Taman Pemakaman Umum Singkawang” (Singkawang Public Cemetery). This graveyard is on the south side of the road named, Jl. Slamet Riyadi. A satellite view of this graveyard can be obtained with this link.